A Glimpse at Sample Clips from "Sons & Daughters of Thunder"
We are pleased to share with our supporters and fans scene samples from Sons & Daughters of Thunder. The scenes are not in order. There is no dialogue sound--sound will be re-recorded with the actors once the film is edited. The scenes are not color corrected--that will be done with the final cut of the film. The scenes are not final. But it will give you an idea of the fantastic footage we are editing and the scope of the production. Our thanks to everyone who supported the making of this film--our contributors, fiscal sponsors, the historic sites that welcomed us, our tireless crew and brilliant cast. And, our deep gratitude to Earlene and Kent Hawley. Without them there would be no Thunder. Remember to LIKE the Sons & Daughters of Thunder's Facebook fan page to get all of the updated news! Follow this link and click LIKE at THUNDER! Now sit back and enjoy a glimpse of what you will see March 2019! Sons & Daughters of Thunder premieres March 2019! The Dillon Home Museum is expecting a busy day of tours on Thursday, April 18th,--the big day of the Sons & Daughters of Thunder Sterling premiere. Several key scenes were filmed in the Dillon Home for the historic docudrama. Twelve lead actors and nearly 70 extras re-enacted the true events surrounding the first public debates concerning the abolition of slavery at Lane Seminary in 1834 Ohio. The Dillon Home was the stand-in for the real-life Lyman Beecher house located on Lane Seminary grounds in Cincinnati. Linda Heckler was the curator of the Dillon Home at the time of filming and was assisted by Kimberly Smith. The two women became honorary production assistants for Thunder, lighting candles, moving furniture, helping the cast and crew in whatever way they could during the winter and spring months of 2014. Current Dillon Home curator Erin Thompson assisted the Rundles with pick-up filming in the house in early March of this year and has been busy arranging the special benefit screening of the film in Sterling. The Thunder production team was so grateful for the use of the Dillon Home Museum for the film, they decided to do a special Sterling premiere screening event to raise money for the continued preservation of the historic site. The film will be shown at 6PM on Thursday evening, April 18th at Sterling High School's Centennial Auditorium, 1608 4th Avenue. The Rundles will be joined by 9 stars from Thunder following the film to take part in a Q&A. Tickets are $6/pp and can be reserved at www.centennialauditorium.org. The website states that "the Dillon Home is a work of Italianate Architecture built in 1858 for Civil War Brigadier General Edward Needles Kirk. The Kirk’s had plans to raise a large family in the home, but when Edward died from a wound sustained at the Battle of Stone’s River, his wife Eliza returned to Pennsylvania. The home went through few changes, but several owners, before Washington Dillon purchased it in 1882. Filled with treasures and virtually un-touched by time, the home is a place you must visit to learn the local history. Home to P.W. Dillon, President of Northwestern Steel and Wire, the homes’ grandeur is a remarkable sight, as his wife, Crete, was an avid traveler, and collector of eclectic pieces and period furniture. Unique from most historic home museums, The Dillon Home retains all of the original furnishings and belongings, as the estate was conveyed to the Sterling Park District after PW.’s passing in 1980." The magnificent Dillon Home is open for guided tours Tuesday and Thursday-Saturday (closed Sunday-Monday and Wednesday). Visit https://www.sterlingparks.org/location/dillon-home-museum/ for touring hours or to arrange your wedding or other special event at the Home. Many St. Ambrose alumni have premiered on big screens across the Midwest. Alumni Jessica (Denney) Taylor '09, Kimberly Kurtenbach '96, Anthony Stratton '12, and Daniel Rairdin-Hale '04 all partook in the recent debut of Sons & Daughters of Thunder. This docudrama is based on historical events that influenced young Harriet Beecher-Stowe, the author of "Uncle Tom's Cabin." This book sparked the beginning of the end of slavery. The docudrama was made by local documentarians Kelly and Tammy Rundle, owners of Fourth Wall Films. The film was based on a play written by Earlene Hawley and Curtis Heeter. "Thunder's" Kimberly Kurtenbach was the film's Executive Producer, casting director and played "Catharine Beecher". Executive Producer Kim Kurtenbach also served as the casting director and played Catharine Beecher, the sister of Beecher-Stowe. Jessica Taylor played Harriet Beecher-Stowe, and shared the spotlight with her husband Tom Taylor who portrayed Theodore Weld, an outspoken abolitionist of the time who greatly impacted Beecher-Stowe's view of slavery. Anthony Stratton played James Thome, a fiery abolitionist and friend of Weld's, and Rairdin-Hale played Professor Calvin Stowe, Beecher-Stowe's admirer and future husband. Jessica Taylor as Harriet Beecher and Daniel Rairdin-Hale as Calvin Stowe. "I think I wanted the role because I was fascinated with Harriet Beecher-Stowe, and she was small and brunette so I could do that!" Jessica Taylor said. "The experience surpassed what I could've imagined. To see everyone in their costumes in the element was amazing. It was a very unifying production." The casting took place about five years ago, but the Rundles began work on the project five years earlier. The cast immediately faced some challenges when Kurtenbach was diagnosed with cancer, and Jessica Taylor became pregnant. Despite those hiccups, the show continued without any consideration of recasting. "The Rundles did a fantastic job of bringing artists together," Jessica Taylor said. "The Rundles are tremendously kind, supportive, and hard-working. The working environment was stellar." Filming took place in a variety of historical locations: the Dillon Home Museum in Sterling, Ill.; the Harriet Beecher-Stowe House in Cincinnati, Ohio; the Harriet Beecher Stowe Center in Hartford, Conn.; and the Jenny Lind Chapel in Andover, Ill. The film debuted at the Putnam Museum and Science Center on March 16. Since then, the film has traveled to the Garfield Theatre in Cincinnati, Ohio, where Beecher-Stowe lived 18 years of her life, and where the Lane Theological Seminary Debates took place. A benefit screening also took place at Augustana Lutheran Church in Andover, Ill. Soon, one will be held in Sterling, Ill., as thanks for the use of the Dillon Home. 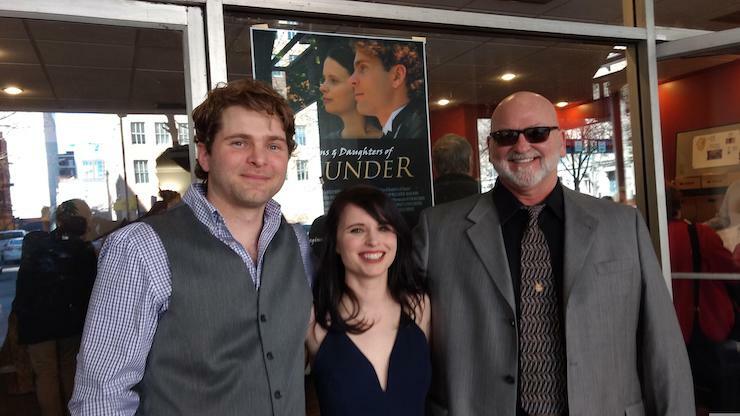 The Taylors and Janos Horvath attended the premiere at the Garfield Theatre in Cincinnati, Ohio March 23rd. Both showings sold out. "It was a big family reunion at the Putnam," Jessica Taylor said about seeing the work come to fruition. "I have grown so much as an artist, so it's interesting to look back and see what I did differently." "I would concur that the nostalgia was heightened a bit because of the time between the filming and producing," Tom Taylor said. "There were memories on set during certain scenes that I had forgotten until I saw them." Thomas Alan Taylor as Theodore Weld and Anthony Stratton as James Thome. So far, the reception of the film has been very encouraging. Most premieres have sold out, and many audience members have already pre-ordered the DVD. The film will screen at film festivals starting this summer and other venues and art theaters throughout the country, and broadcasts will follow early in 2020. "We're as excited that they're enjoying it as they are to have us here," (Denney) Taylor said while at the Andover screening. "It's been surreal." The film will continue to traverse the Midwest and beyond in hopes of reinvigorating a forgotten history. For more information about the docudrama, visit lanerebelsmovie.com. For information about Fourth Wall Films' other documentaries about Midwestern history, visit their website. Preorder the Sons & Daughters of Thunder DVD and save $6! Click HERE! Filming during Sons & Daughters of Thunder in April 2014 at the Dillon Home Museum. There may not be a red carpet, but that won't stop the stars from showing up for a movie premiere right here in Sterling. Former Dillon Home curator Linda Heckler (center first row) became part of the production family during filming. The filmmakers and the cast will give a short talk before the screening, and "afterwards, there will be a chance to chat and reminisce." Tickets to see "Sons & Daughters of Thunder," which will be shown at 6 p.m. Thursday April 18 in Sterling High School's Centennial Auditorium, cost is $5 in advance and at the door. Go to www.centennialauditorium.org or call the box office at 815-622-3248. We are reaching out to our friends and supporters regarding our first narrative film Sons & Daughters of Thunder. We are so pleased to report that it is going over wonderfully well at our initial audience screenings! We are raising final funds (another Thunder Funder) for the film's music score (composed by William Campbell who did the music for the Oscar-nominated "Lifeboat") and sound before submitting it to film festivals and broadcast consideration. We are hopeful that we can get a number of Thunder fans and supporters to kick in $25 or more to reach our modest goal of $2,000. We have less than 25 days via our Indiegogo campaign and appreciate ALL support! To find out more about this based-on-a-true-story film about the beginning of the end of slavery in America, visit LaneRebelsMovie.com. Visit the link below, check out the awesome perks (screen credit, DVDs, posters, movie props and more), and how easy it is to contribute! Do share the campaign with those you think would be interested and spread the word! We are very grateful for your wonderful support and help on this special project! Thunder actors Don Denton and Justin Marxen will attend the Sterling Benefit Event April 18. Nearly one dozen of the stars who appear in the new Fourth Wall Films' docudrama, Sons & Daughters of Thunder, will attend the special Sterling, Illinois benefit screening Thursday, April 18th at 6pm at Centennial Auditorium at Sterling High School, 1608 4th Avenue, and take part in Q&A after the movie. Tickets are $6/pp and can be reserved at www.centennialauditorium.org. Proceeds benefit the preservation of the Dillon Home Museum. Jessica Taylor (as Harriet Beecher) and Chris Ryder (visual effects) will attend the Sterling event. The Dillon Home Museum in Sterling, Illinois served as one of the key locations for the movie, with numerous scenes filmed inside and outside the historic site. Principal photography for Sons & Daughters of Thunder took place in Illinois, Ohio and Connecticut. Thomas Alan Taylor (Theodore Weld) and Tristan Tapscott (Henry Thompson) will appear at the Sterling event. “We are very happy to return to Sterling to showcase Sons & Daughters of Thunder in Sterling, and raise funds for the preservation of the historic Dillon Home Museum,” said director Kelly Rundle. "Curators Linda Heckler and Erin Thompson, the Dillon family and the Sterling Parks District were so supportive and helpful while filming the movie. We are happy to say 'thank you' with this benefit event. Actors Mike Kennedy and Tom Walljasper will appear at the Sterling Benefit Screening of Thunder. "The film is resonating with audiences and people are moved by the story and the exceptional performances by the actors--many of them from the Quad Cities region," said producer Tammy Rundle. "Sterling became our home-away-from-home for several months during filming, and the film's stars have fond memories of their experiences at the Dillon Home. We are happy so many of them want to take part in the benefit program." Reserve your tickets at www.centennialauditorium.org. Actor Travis Shepherd (far left front) will appear at the Sterling event. Based on the critically-acclaimed play by Earlene Hawley and Curtis Heeter, Sons & Daughters of Thunder tells the true story of the 1834 Cincinnati, Ohio Lane Theological Seminary anti-slavery debates. The controversial meetings, led by abolitionist and firebrand Theodore Weld (played by actor Thomas Alan Taylor), were the first to publicly discuss the end of slavery in America. The meetings angered Cincinnati residents and Lane Seminary officials, who promptly slapped a gag order on the entire student body. This action was followed by a freedom of speech protest and mass exodus of Lane students to Oberlin College. A young Harriet Beecher’s (played by actress Jessica Taylor) exposure to the debates and Weld's continuing work to free the slaves sparked a flame that led her to write her magnum opus Uncle Tom's Cabin. Sons & Daughters of Thunder was partially funded by a grant from the Quad City Arts, the Illinois Arts Council, with support from the Friends of the Harriet Beecher Stowe House, Walnut Hills Redevelopment Foundation, and the Bix Biederbecke Inn. The Moline Foundation and the Shell Rock Community Historical Society served as the fiscal sponsors on the film project. The Rundles are the producers of multiple award-winning historical documentaries and the Mid-America Emmy® nominated documentaries Good Earth: Awakening the Silent City, Country School: One Room – One Nation and Letters Home to Hero Street. A special Dillon Home Museum benefit screening of Sons & Daughters of Thunder, a new film by Mid-America Emmy® nominated filmmakers Kelly and Tammy Rundle of Fourth Wall Films, will be held on Thursday, April 18 at 6:00 p.m. at Centennial Auditorium at Sterling High School, 1608 4th Avenue, Sterling, Illinois. Tickets are $6/pp and can be reserved at www.centennialauditorium.org. Proceeds benefit the preservation of the Dillon Home Museum. “It is exciting to return to Sterling to showcase Sons & Daughters of Thunder in Sterling, 185 years after the nation’s first public debates regarding the abolition of slavery,” said director Kelly Rundle. Former curator Linda Heckler poses with Thunder cast members. Sons & Daughters of Thunder is slated for national release in April 2019 with screenings in independent theaters and film festivals. It will be released nationally on DVD in late July, followed by broadcasts on PBS stations. For more information about Sons & Daughters of Thunder, visit www.LaneRebelsMovie.com. Dillon Home curator Erin Thompson lights candles for filming.